This 2ft high "Jack's Tavern" Pirate themed Pub advertising sign is a great wall-decor piece for any nautical themed area. This Pirate Pub-Sign for "One-eyed Jack's Tavern" is one of a set of three themed wall-decor advetising plates. Boasting the legend "Ravage the Wenches, Plunder the Booty" the one-eyed, hooked Pirate Captain is ideal for decorating your Pirate themed venue. 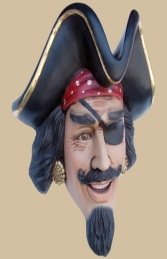 This painted 2ft high advertising sign is made of wood with a low relief model of a Pirate in resin, it's a great theming piece for Pirate or nautical areas in shops, pubs, restaurants etc. This wall decor looks great with our other Pirate Pub signs, the Pirate Menu-board and the Nautical themed wall decors. PLEASE CONTACT US ON 01626 833646 or 07860 680181 TO DISCUSS THIS & THE OTHER PROPS, DECOR FEATURES & FIGURES IN OUR PIRATE SERIES. PLEASE PHONE US TO PLACE AN ORDER & FOR A QUOTE FOR DELIVERY COST TO YOUR POSTCODE.